It's actually pretty hard to pick one bike out of each of the day's entries. For example, today I had to pass over an interesting Follis tandem and a phenomenally well color-coordinated commuter... It isn't that I like those any less - more that some tiny little thing in another Gallery post strikes a chord or catches a memory. As I've commented more than a few times, there's honor in getting a disused bicycle up and running again - whether it's been sitting out under the eaves benefiting from seasonal weather and annual disuse or it's been forgotten out of the elements in some sort of Tomb of Tutankhamun manner. The second thing about today's featured entry is the manufacturer - Dawes. Sharp-eyed or long term followers of the Gallery might know that the first bike in it was my Dawes Double Blue, which was scooped from a dusty and forgotten pile at a garage sale. It got resurrected, cleaned up and readied again for use. 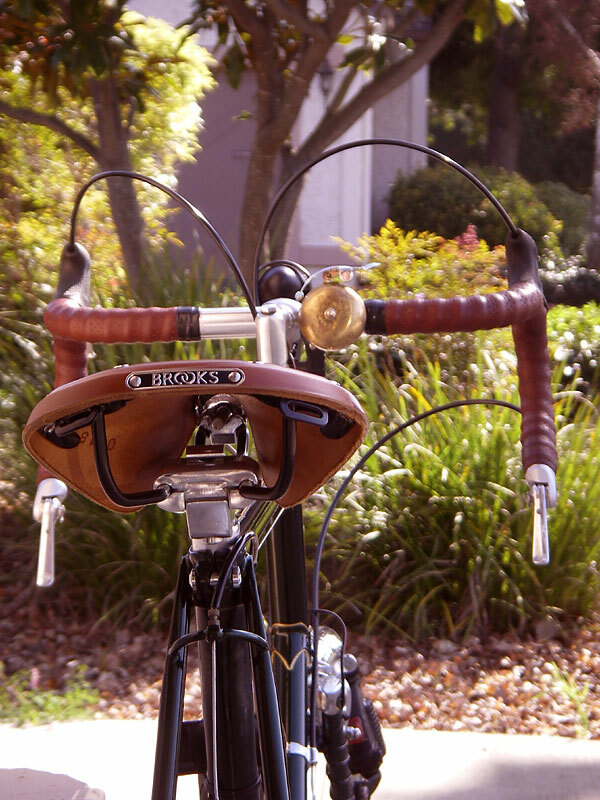 It was the second bicycle I made into a fixed-gear (thanks again to the late, great Sheldon Brown! ), the second road bicycle I purposely fendered and the first bicycle which I ever broke a crank on. It rides with a stately, yet nimble gait which is different than any other bike I own. Dawes used to be a UK manufacturer, but faded into disuse. Their name (along with others) got scooped up and is now slapped on a line of down-market bikes imported into the US (and probably other places). They have nothing to do with this era. Although Dawes was never a higher-end British maker, they had some excellent models. The Dawes Galaxy is one of those. This was one of those attic finds that lent itself extremely well to a refurb and makeover. Looking at this bicycle, you realize how many nice touches mark its crafting - the double edge of the forward seat lug shape, the brazed-on loop which acts as a cable guide to the rear brake, the chromed fork and rear triangle and the significant head badge. (The paint job is gorgeous, but was added in the restoration). It appears to have similar dimensions to my Double Blue, and it's funny how we both ended up with bikes that have a more "French" dimension, leading to a small amount of seatpost showing. Nice to see it getting newer components and being ready to ride again. I wanted to thank you for the compliments! I was pleasantly surprised to find that mine was the bike of the day!